East Africa has a generations' old legacy of Ismaili community construction. Every town, and many villages, had at least one building: the Jamatkhana. Tanga, right in the middle of the East African coastline epitomizes this brick & mortar heritage: Jamatkhanas, schools, rest house, club, family housing, condominiums for widows, cemetary. This is its chronicle. 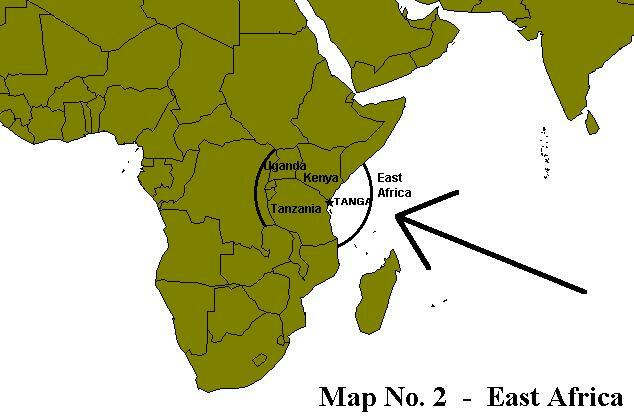 Tanzania, prior to its union with Zanzibar, was known as Tanganyika. Tanganyika, in turn, used to be Deustch Ost Afrika (German East Africa) before the 1st World War. Tanga, Pangani, Bagamoyo, Dar es Salaam, Kilwa and Lindi were important ports during German reign. Pangani, about 50 kilometres south of Tanga, had an Ismaili population of 200, bigger than Tanga. It was the seat of the local Ismaili Council. 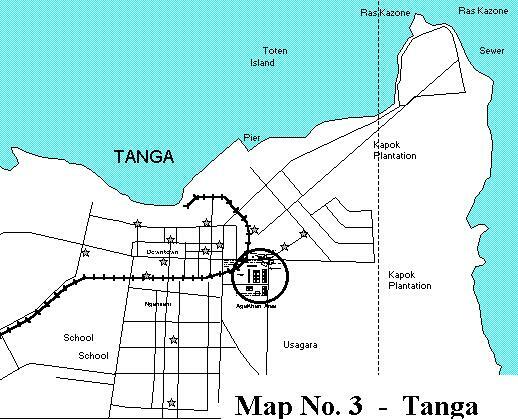 After the 1st World War, when the British were given a mandate under the League of Nations (the U.N. predecessor) to govern Tanganyika, Tanga became the main port of the region. In view of this, the Ismaili Council was moved to Tanga, and thus the Ismaili population there grew. The first communal building, of course, was the old jamatkhana (old because it was replaced decades later by a grand one). It was erected in 1928, and officially opened on new year's day, 1929. The Ismaili population had reached about 500. Less than 10 years later, it had to be extended to accommodate the greater needs of the growing community. The architecture of the extended jamatkhana was typical of a gujerati "haveli" (mansion), with its quintessential courtyard in the centre. The "otlo" (unenclosed porch) was featured throughout the ground floor. Khushiali festivities would take place in the central courtyard, with people sitting down on sadhris (straw mats) on the surrounding "otlo", on the concrete stairs leading up to the jamatkhana chambers on the upper floor, and leaning over and looking down from the galleries on the upper floor. 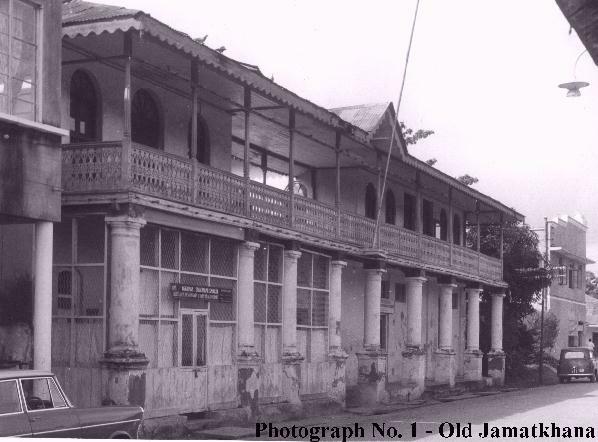 The ground floor space housed: (1) the council chamber and secretarial office; (2) a baby clinic, and later a medical clinic - or dispensary as it was called; (3) jamatkhana needs like cooking for feasts. From 1944, the club building functioned during the day as the Aga Khan Nursery School (kinder garten). Next to it to the west was the children's playground with swings, slides, see-saw, etc. On the other side was, of course, a volleyball court. Tanga, over the decades, was a volleyball powerhouse. In 1961, the north end of the club was reconstructed to house a drama stage and change room. Many a play, film, magic show, and of course, khushiali variety show took place on this stage. In 1948, a temporary school of 'makuti'-thatched roof (makuti: dried palm fronds weaved into mats) with open sides was built near the north-western corner of the Usagara property. Prior to this, the school was housed in a rented double-storey building on Market Street (which later became the Avenue Hotel and Star Bar). In 1954, the Aga Khan Primary School proper was built to the east of the club. From the air, it stood out as the letter T (for Tanga!). Each arm of the letter T housed two classrooms, to accommodate in all six standards (grades). To the north of the school playground were built 3 detached houses as teachers' quarters. The official opening of the school was performed by His Excellency Sir (later Lord) Edward Twining, Governor of Tanganyika on Friday, October 8, 1954. His Serene Highness Prince Aly Soloman Khan, eldest son of Aga Khan III and father of the present His Highness Prince Karim Aga Khan IV Shah Karim Al-Hussaini, later gave this motto to the new school: "Men sana in corpore sano" (A Healthy Mind In A Healthy Body) which is emblazoned on wall of the Assembly Hall. In 1963, a separate two-classroom wing was opened to house standards seven and eight. The school is now known as Darajani (Bridge) School. Homes-for-All Scheme [see Map No. 4]. This construction project cost 235,000 shillings**. In 1955, on the remaining land of the Usagara property, a sub-division of semi-detached bungalows was developed called the Aga Khan "flats" (meaning apartments, although apartments they were not). There were also a few detached and two-storey/two-family units. Also built were flats for widows (condominiums) near the north-east corner of the Usagara property. The project was financed under a local Ismailia Building Society Tenant Purchase Scheme, with a total budget of 1.7 million shillings**. In 1957, a lodging rest house of four rooms was built south of the widow flats. Visi (catered food) was available from families in the neighbourhood. 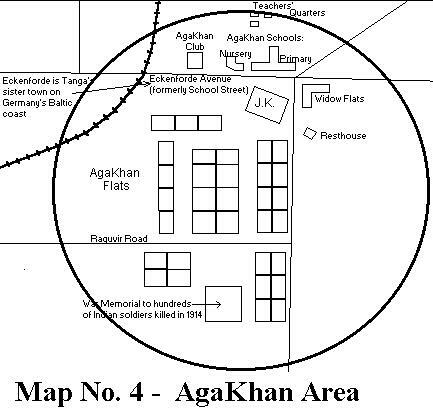 In 1960, the Aga Khan Nursery School proper was built between the primary school and the club. In 1964, a concrete wall with beautiful arc lattice-work on the upper third was built around these three properties. In 1961, a wall similar to the above, was built around the cemetary on Pangani Road on the southern fringes of Tanga. Also built were a shelter, outhouses, storage, car park, and electric lighting. We lastly come to the grandest building - a land mark of Tanga. It has a long and, for a time, agonizing story. On April 9, 1956, Prince Aly Khan laid the foundation stone for a new awe-inspiring jamatkhana in whose architecture he took personal interest. Unfortunately, he would not live to see it constructed. Only a year or so after construction began, it was halted due to contractual problems. Upto that point only the ground floor and its walls were constructed. For several years, it stood in ruins. The only bright light in all this, at that time, was that it was an adventurous playground for children living in the Aga Khan flats! But before long, the project was revived. The site was excavated and the jamatkhana was built completely from the foundation up. On Friday, August 9, 1963, it was officially opened by the Honourable Rashidi Jumaane Abdallah, Regional Commissioner of Tanga Region. Prince Karim Aga Khan sent his "best loving blessings for the success you have had in the construction of the new Jamatkhana." Three years later he gave didar (audience) to the Tanga jamat in this jamatkhana that his late father had 'started'. The jamatkhana, its furnishings and adjoining buildings for the jamatbhai (jamatkhana keeper) and the library, cost approximately 800,000 shillings**. Its chief identifying feature is, not one, but four domes one at each corner of the roof, giving it a distinctive Islamic look. The upper level is the main prayer hall. The east end of the lower level houses the council chamber and office. The west end, (1) a dispensary, (2) a dentistry, (3) an antenatal, postnatal and child welfare clinic. In middle of the lower level is the social functions hall. The ground in front is green lawned, and in front of the facade are tall coconut palm trees. The large compound to the west, in the middle of which lies a big marble water fountain, is otherwise left bare for dandia ras (Gujerati stick dance) and other programs during celebrations like Imamat Day. Terrazzo-finished concrete benches are lined up along the perimeter wall, which were very popular meeting places (before and after prayers) especially for the senior members of the community. This then is the Ismaili construction legacy as seen through the developments of one town in East Africa.